TRADITIONAL FOLK music & dance SHOW! Traditional Russian folk music and dance shows are very entertaining, touching, and YES touristy. One of the best ways to get a lovely taste of Russia is definitely by watching a wonderful traditional folk music and dance show. Of course, many of them are tourist oriented and therefore pricey, but there is no other place where you can enjoy a vast showcase of traditional music, singing and dancing from Russia combined with a mix of architectural beauty in an hour and a half. 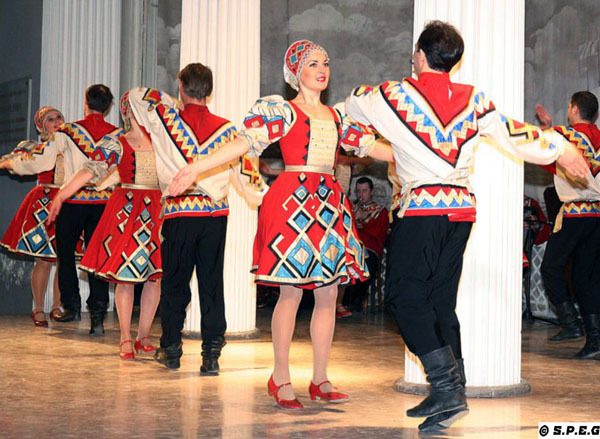 If you decide to spend one of your evening by watching a Russian folk song and dance, then check out below our recommendation on where to go for experiencing the best history, spirit and traditions of Russia in an entertaining way. If you go, make sure you arrive early to find a seat. Ready to go? See below the top 3 venues where to watch a Russian folk music and dance show in St Petersburg Russia. Enjoy this Russian music show and immerse yourself in Russian Cossack folk history. Bagatitsa translates as “bonfire” and this is a lively, spectacular, professional show with great music and costumes enthralling audiences with genuine Cossack performers. The venue is the mansion of Russia’s once richest woman, Countess Sofia Vladimirovna Panina, who dedicated her life and fortune to fight against illiteracy and dullness. This show is a great legacy! The beautiful theatre has seating for nearly 800 people, and as the show doesn’t include dinner, it is an affordable option. Opening Hours: This place is not open to the public for excursion. Where to buy tickets: Check out their website for info on tickets and show schedule. Tips: The place is worth visiting every time of the year, but keep in mind that summer time-is a high season, so buy your tickets well in advance. Recommended dress is smart casual. The Nikolayevsky Art Centre, the sponsor of Russian folk shows in St Petersburg, is situated in the Nikolaevsky Palace and is named after it. The folk show is much acclaimed and the Grand Duke’s Palace has a stunning décor of a bygone era, from the gorgeous marble gala stairs to the luxurious halls. The “Feel Yourself Russian” folk show is now world-famous and conveys the deep history of the country and Russian people. In addition to the show, you can book a tour, or make group bookings for meals, meetings, seminars, or conferences. The palace is not far from the Admiralty and Palace square. Opening Hours: The Nikolaevskiy Palace is not open to the public, but can be seen only on a guided tour booked well in advance. Tips: You can see the palace only on a private booking tour, or when they host their popular evening folk music and dance performance. Recommended dress is smart casual. "A Feast For The Eyes!" This Russian folk show, Russia in Fairytales, offers a wide range of authentic songs and dances that give a beautiful visual representation of the history of Russia. Fantastically athletic male dancers complement the beautiful Russian women dancers. Marvel at the gorgeous costumes which are especially made for the show by famous costumiers. The show is in two parts with a 20-minute intermission during which you can obtain refreshments and finger food from the buffet. The show runs from early May to the beginning of October each year. Opening Hours: The officer house is not open to the public for excursion. Tips: Time and date for the show vary for each year calendar, so make sure you call before you go. Recommended dress is smart casual.